The overall shape of the (f)route POD is inspired by the seed pods of a eucalyptus tree, and is handmade as eight separate leaf-shaped bamboo modules that are secured together with steel hinges. The curved pieces that make up the POD’s distinctive, elegant shape—and structural support—are comprised of several thin layers of bamboo, warped into shape, laminated and secured together. Bamboo cross beams are then affixed across each module, with space made for windows and doors and a recycled fabric covering to protect from the elements. On site, the POD sits atop a solid base—for its installation at the (f)route gathering in Australia, it sat atop a platform of finished shipping pallets that not only lift the pod up from the ground, but provide space for an outdoor seating area. Panels of the pod’s cloth covering can be lifted up to form awnings, and a seamless transition between the indoor space and the outdoors is created. With an internal maximum height of 2.4m (8 feet), and a diameter of 3m (10 feet), there is ample room for inhabitants to comfortable move around the pod, and natural light can stream in through the very top of the pod as well as through its windows. At night there is an elegant woven bamboo lamp to illuminate the pod. 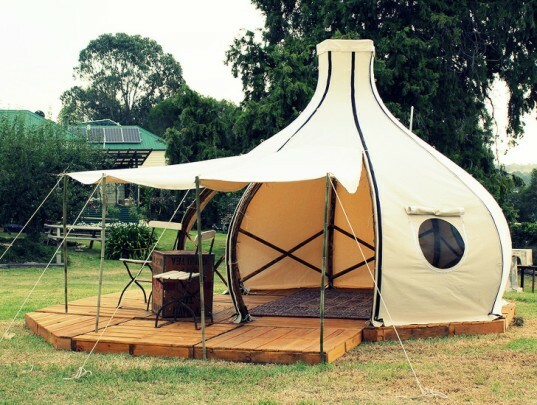 The (f)route pod was originally created as a “campster” for the (f)route network of “artists & fruitists” in East Gippsland, Australia—but Giant Grass notes on their site that you can contact them if you are curious about buying one for yourself. 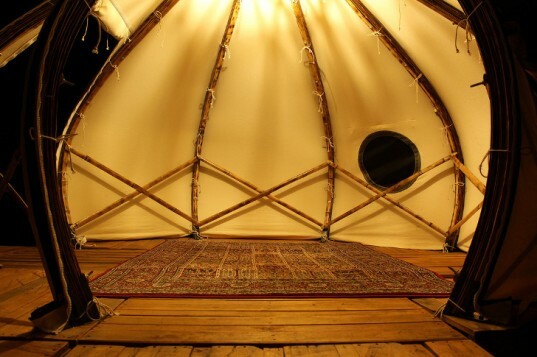 In addition, they have an impressive array of sustainably built bamboo structures on their website. Head over to Giant Grass to see more. 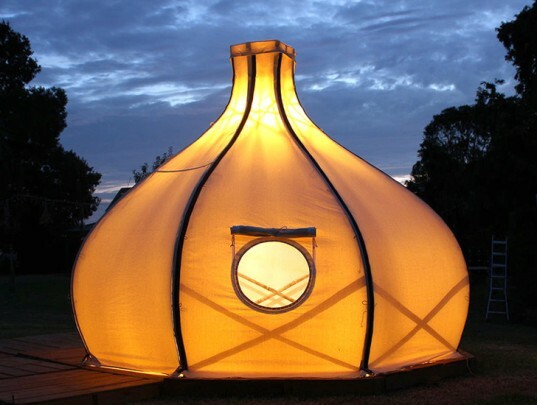 The overall shape of the (f)route POD is inspired by the seed pods of a eucalyptus tree. In addition, they have an impressive array of sustainably-built bamboo structures on their website. The POD is handmade as eight separate leaf-shaped bamboo modules that are secured together with steel hinges. The curved pieces that make up the POD's distinctive, elegant shape—and structural support—are comprised of several thin layers of bamboo, warped into shape, laminated and secured together. Bamboo crossbeams are then affixed across each module, with space made for windows and doors and a recycled fabric covering to protect from the elements. On site, the POD sits atop a solid base—for its installation at the (f)route gathering in Australia, it sat atop a platform of finished shipping pallets that not only lift the pod up from the ground, but provide space for an outdoor seating area. Panels of the pod's cloth covering can be lifted up to form awnings. This helps to create a seamless transition between the indoor and outdoor environments. Natural light can stream in through the very top of the pod as well as through its windows. With an internal maximum height of 2.4m (8 feet), and a diameter of 3m (10 feet), there is ample room for inhabitants to comfortable move around the pod. 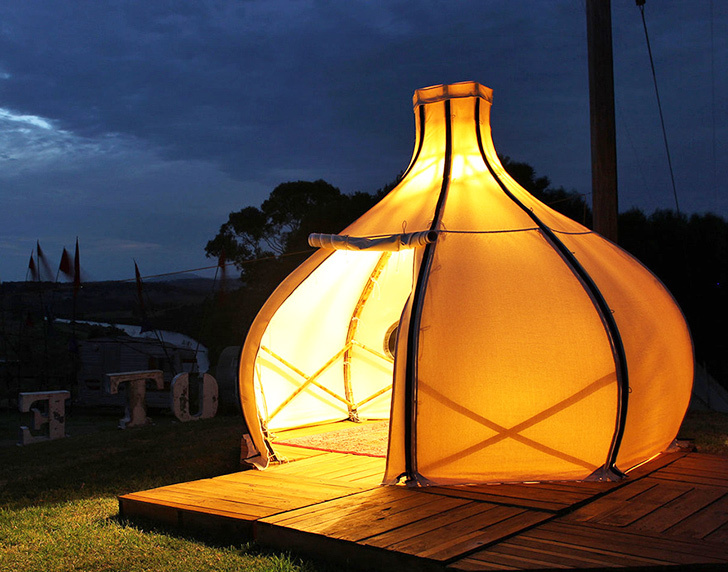 At night there is an elegant woven bamboo lamp to illuminate the pod. The (f)route pod was originally created as a "campster" for the (f)route network of "artists & fruitists" in East Gippsland, Australia. Giant Grass notes on their site that you can contact them if you are curious about buying one for yourself.